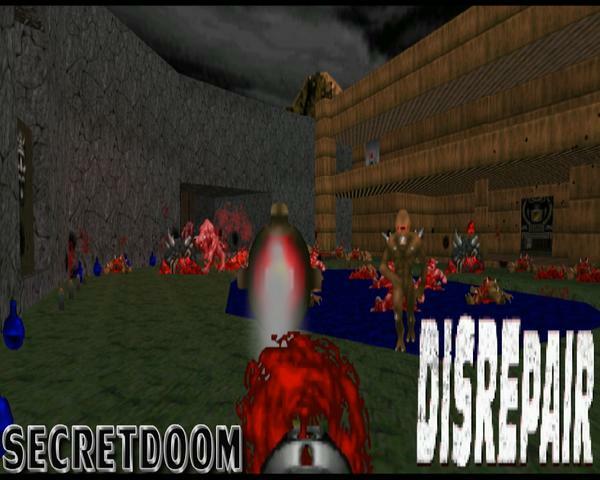 Cyberdemon531 debuts on the Doom scene with Secretdoom: Disrepair, a ten-map Doom II episode for GZDoom released in 2014. Well, there's a little more to it, but not that much. The mapset has nine normal levels and one secret, plus seven rearrangements of earlier works for a survival-oriented horde mode. There isn't really anything to it storywise. It's got an ending blurb but it looks like your typical "Doomguy fights off Hell" thing. 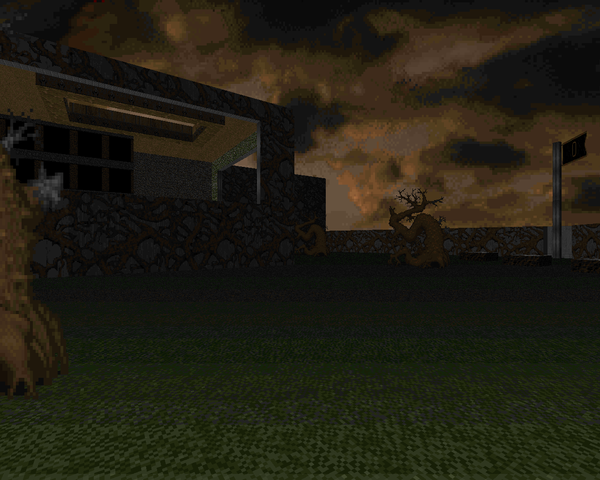 "Sojourn" is the eleventh level from Bob Evans's LORDDOOM mapset, most of which was released as Doom II singles in 1995 on Compuserve, only made available more than eighteen years after the fact when the author revised his distribution clause, which was intended to deter shovelware producers from profiting from free material. The story sort of seems like a series of loosely-connected vignettes about Doomguy as he travels across a planet that's inhabited by humans but mostly covered by demons - err, aliens. After clearing out an alien-controlled airport, followed by something that only Evans can tell us, you find yourself clearing out an underground base full of the beasts, but the opposition is thick and there's a lot of area to cover. Bob Evans released ten of his seventeen LORDDOOM levels as the Odessa series. One of them ("Silures") ended up in Eternal Doom. As for the rest, no man save Bob can say. 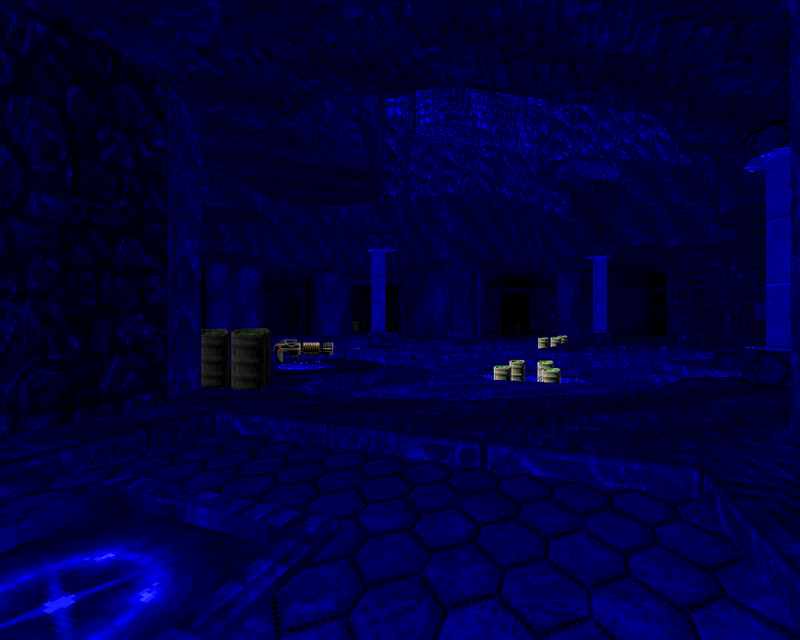 The Odessa series is a nice run of fairly polished 1995 Doom II levels, with a diabolical twist. 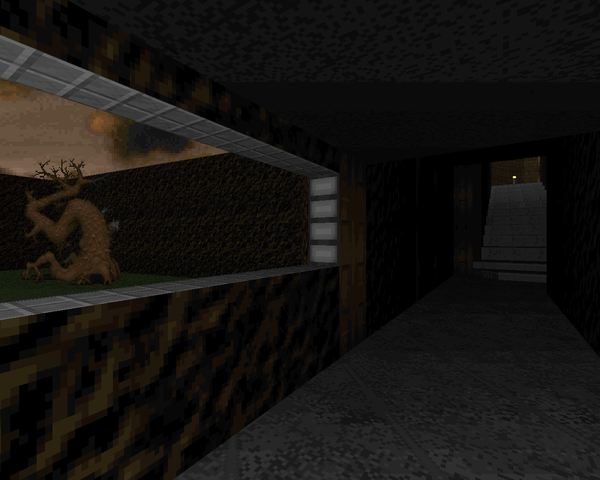 Evans loves Doom puzzles where most people can't stand them. The previous four Odessa levels were pretty good about it, but Odessa 7 takes a sharp left turn into something more like "Silures", which figures, as it's the only Odessa map published in 1996. 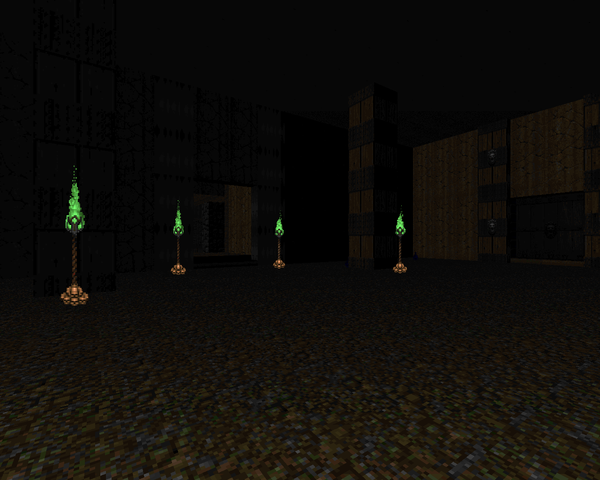 This time, you're tackling a sanctuary for monks that at one point practiced black magic. They're no longer inhabiting the temple, but the infernal aspect remains with various evil shrines tucked deep into secret passages that you have to navigate in order to secure all six keys, for without them, you will never escape. After being gone for so long, Bob Evans returned from the mists of time to put his clause-bound Odessa series on the /idgames archive. In spite of there being an Odessa 14, not every level in between made it to a releasable state. Only Evans knows what happened to Odessa 4 and 5; presumably they weren't up to snuff or exceeded Doom's limits. In any case, after conquering the subverted health club of Odessa 3, skip a few scenes and you're on to Odessa 6, Kastle Baron. There's no leadup, you're just slaying more demons on your noble quest, and this time it's in a castle, a setting Bob favors, as we all know well. Doom's 20th Anniversary rolled around not too long ago and brought with it the return of some old community members. 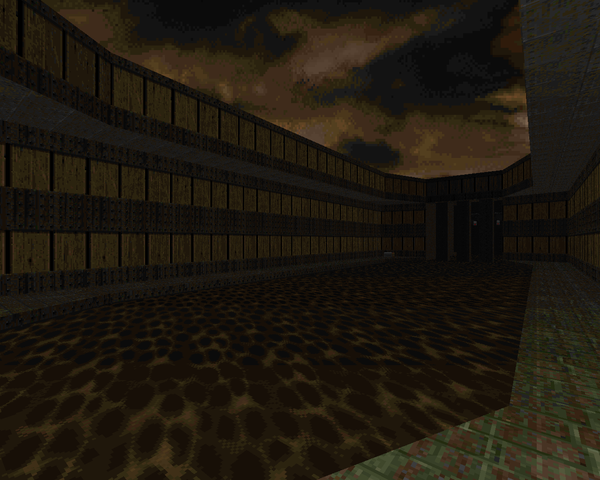 Sverre Kvernmo, of Cabal / Eternal Doom fame, had stuck around as "soundblock" but made a splash with this brand new level for Doom II. 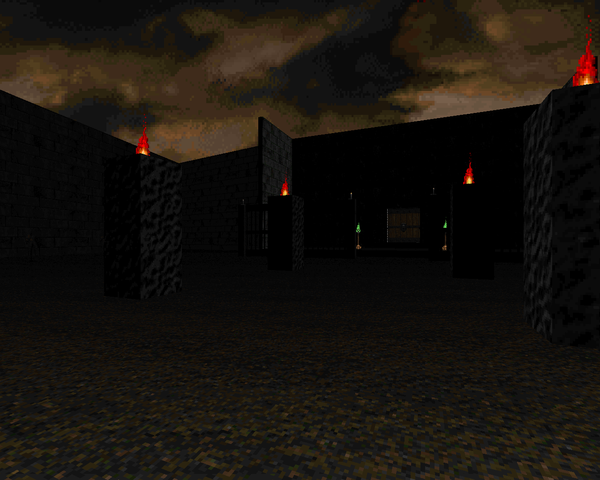 Plasmaplant is a MAP01 for ZDoom that has its origins in the Cabal series, some nineteen years ago, though you wouldn't know it looking at the design. Kvernmo sends you (either the last living marine OR the humanized Cyberdemon of the Cabal) to tackle an infernal organ player who is apparently the mastermind of the (current) demon invasion and make his eternal opus a fitting swan song. Way back at the tail end of 2011, Doomworld Forum superstar kildeth had an idea for a community project. Where the Community Chest series aimed to combine the works of authors who would never be capable of making a megaWAD on their own, NOVA's goal was to make a limit-removing PWAD out of maps made by newbie authors. Now in 2014, more than two years later, we can reap the rewards of their learning experience. 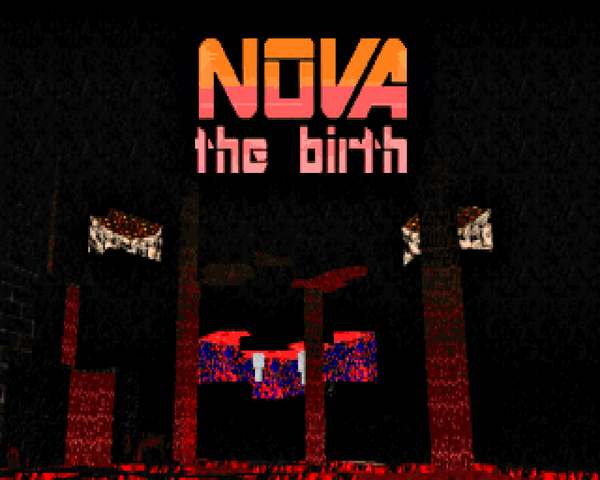 NOVA: The Birth doesn't have a story outside of the new intermission texts. Hell is warping reality again, and no one else can see it, almost as though it's drawing Doomguy into its infernal embrace. You're nothing if not an unstoppable evil-destroying siege engine, though, so the outcome of this encounter is all but predetermined. Bob Evans gained some fame as the author of the impossible-to-find ODESSA levels in addition to releasing the most cryptic maps to grace Eternal Doom. After a long hiatus, he came back to the community, and thankfully allowed himself to be talked into re-uploading his long-lost works. Odessa 3, aka "Fade to Gray", is the third single 1995 release in a series which started with the clearing of an arena complex followed by the hero wresting control of an oasis from a team of Hellspawn. Here, the teleport leaves you outside a building that's odd due to its mundane nature - a health club. When you look inside, though, you see one of your friends, which would be reassuring were it not for the fact that he's been dead for two years. Looks like you're still in the thick of it! Bob Evans was working on a project called LORDDOOM but decided to split it up, releasing the levels piecemeal as the Odessa series. Not all of them made it to completion, and fewer still made it to the idgames archive until 2014. Now, though, we can all scratch our noggins to Bob's fairly uncompromising gameplay style. 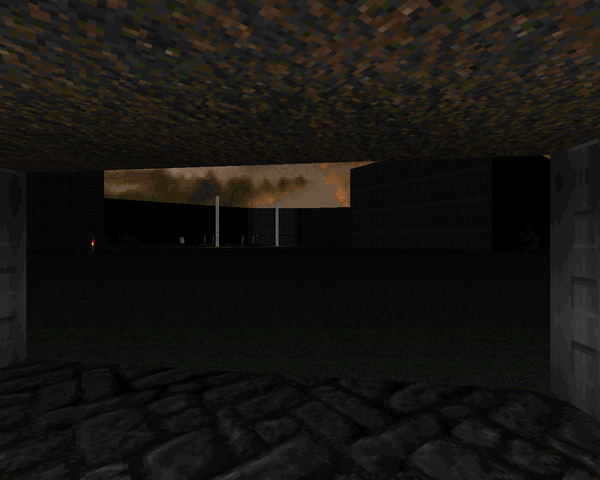 As is the case with the first in the series, Odessa 2 - aka "Oasis" - is a single map for Doom II, released in 1995. There's a brief aside about long journeys, rest, food, and water. The long journey refers to the "story" of the Odessa series, and rest assured, there will be water. Don't hold your breath for food or rest, though.